Anne Willan renders an intimate appreciation of both the food and the culture of Burgundy in From My Chateau Kitchen, (Clarkson Potter, 2000), a beautifully illustrated and personal book inspired by Anne’s life at Château du Feÿ in Burgundy. 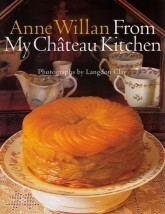 The book features more than 300 color photographs and more than 160 recipes from Anne’s 20 years of living and teaching cooking at Château du Feÿ. Published in the UK as A Kitchen in Burgundy (Cassell).